When it comes to Twitter, the foremost metric most people look at and care about is the amount of followers you have, which can be seen as how much influence your account has. Many tools out there measure analytics about the followers and engagement you already have, but what about getting more followers and engaging a wider audience, as well as measuring the quality of your followers? Tweepi is a tool designed specifically for this purpose. Its goal is to target well-connected accounts or influencers within the Twitter network, help engage them and get them to follow you. It can help manage the quality of accounts you follow and that follow you. Finding potential accounts to widen your Twitter followers is something that can be applicable whether it’s your business or just an individual wanting to grow a personal brand. The process that Tweepi uses to help expand your followers works like this. Simply choose an account in your industry or a valuable influencer that you know of in the “follow friends” option on the Tweepi dashboard, or “follow followers” option, also on the dashboard. Here accounts following your chosen account are listed with relevant data. Instead of spending hours of your time looking at accounts manually they can be sorted en mass. In the listings you can add multiple search criteria. Some valuable stats that I found include showing when an account most recently tweeted so you can weed out inactive accounts and follow ratio. The higher this ratio the more likely those accounts are to follow accounts that follow them. The statistics can be listed in ascending or descending order to find the most or least active accounts for your given search criteria. 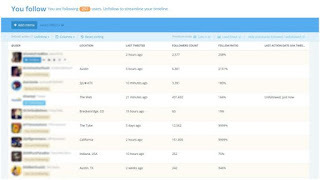 You can also sort by data points like location, an option that could be very useful for a Twitter account based around a local business, or identifying friends of customers in your network who live in the geographic area. Some other features offered by the Tweepi service have to do with making informed decisions about accounts you follow and accounts that follow you, allowing you to tailor where the engagement of your account is pointed. This is done in a very similar process to how you would find new potential followers. Simply pull up the list of your followers and set criteria for things like location, recently tweeted, amount of followers, etc. You can analyze a list of curated Twitter accounts from external databases as long as the account names are in a comma separated value file, something that Excel or other database programs should be able to export. As far as I can tell from the documentation no explicit limitation was set for the number of accounts that could be imported for analysis. From the data available in this analysis you can weed out accounts that are either spam (perhaps bots) or maybe are no longer active. 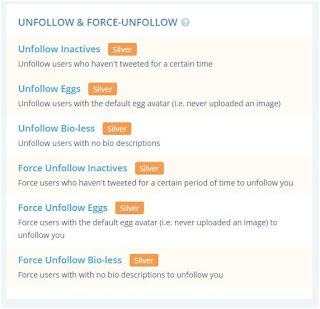 Tweepi offers tools that could save time by causing accounts that have no bio or accounts that still have the default Twitter profile picture known as “the egg” to force unfollow your account, meaning that unwanted users will no longer see your tweets in their feed. 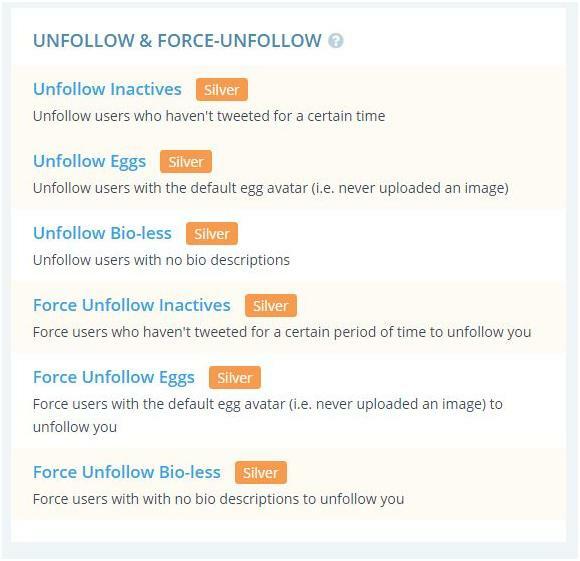 Along with these batch unfollow options, can choose accounts individually and have them force unfollow you as well. This could be a useful tool if you have accounts following you that are toxic or abusive —just an extra step of protection beyond blocking them from your account. If they are no longer seeing your tweets in their feed they might move on and forget you exist. Unfortunately any of these follower management features are not available with a free account. A free account only allows you to use some of the find follower and account analysis features. The amount of results per list page is also limited to 20 or 40 if you're willing to tweet about the service. If you decide to pay for the program that is increased to 100 at Tweepi’s silver level ($12.99 per month) or 200 results per page at the platinum level ($24.99 per month). Other features that are locked up behind the paid subscription are the ability to include Klout scores in the search results, the ability to search account bios for keywords and being able to see lists of users who recently tweeted a keyword or hashtag. Other services provide Twitter account analysis like foller.me and followerwonk. Those services are free and often times go more in-depth into some of the statistics behind accounts, however those services offered results one account at a time and do not to give any of the following management options that Tweepi does. As far as my experience goes with using the product it's pretty simple and straightforward. The user interface is relatively intuitive and adding and editing search criteria is straightforward if you've ever used a search engine before. From the company's about page this seems to be the only product and the team seems rather small so support might a concern. My assumption is if you had a problem or request you would be dealing directly with the developer. This product could be useful for a single individual looking to build his or her brand to a mid-sized company. The limitations of the amount of rows available in search results page would begin to become too cumbersome if you're dealing with Twitter accounts that have 10,000 followers. Larger companies might be looking for a product that would do analysis on sentiment or search engine optimization, which this product does not really touch at all. It mainly focuses on the text, networks and some of the meta information around various accounts. Performance-wise there could be some issues. Whenever you do an action it takes sometimes upwards to 15 seconds for the action to go through, which could be cumbersome if you are making changes in large batches. It's also probably not a tool that you use every day, more likely it's something you would operate once-a-week or month identifying some new accounts to follow and removing unwanted accounts. Overall I'd say this product is a relatively accessible way to target valuable accounts to engage with on the Twitter platform, giving you a top- level analysis of desired accounts in a time-saving manner. Perhaps more valuable than this feature is the ability to manage the accounts that follow you particularly if your account has a community or customer management aspect. Being able to remove followers that are obviously fake cluttering up your ability to engage with actual customers or being able to remove accounts that are abusive or hostile, helps to preserve personal and corporate images. 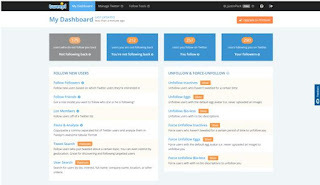 If you're interested in trying Tweepi for yourself you can sign up for a free account at https://tweepi.com. Justin Pack is a digital media enthusiast with a passion for the internet, gaming and video production. He is a graduate student at Tarleton State University pursuing a master's degree in communication.